We have been blessed with wwoofers over the years from all over the world. Each Wwoofer that has come to our home has brought their own individuality and uniqueness. We have been WWoof hosts for over 10 years now. To start off it was just very casual and just to help in the gardens and with the house work. We didn't have many wwoofers come in the first 6 years as we didn't really have a focus on our home and what we offered. I had begun my wwoofing experience at Mana Retreat Centre. This is where I learnt about Wwoofing and would end up bringing the odd wwoofer home with me and so the journey begun. In the last 4 years we changed our view on Wwoofing and became more focused on what we needed and what we could offer. Living Legacy was birthed during that process. The idea of having wwoofers come for a longer period and to actually create something that they will leave here as a mark of their journey of being here, for others to enjoy for years to come is a really strong opportunity that we have begun to see and experience with many of the wwoofers that now come here. April 2011: Gilliaume from France as well, continued the path down into the gully. May 2011: Greta from Sweden has been the only wwoofer who Frankie never ever barked at! Besides creating beautiful clean areas in our home and begun the massive task of reclaiming the studio from dust, mice and rats. Sept 2011and Dec 2011: Marcel and Laura from Germany, who created our beautiful circular raised Vege gardens. Oct 2011: Sarah from Britain, reclaimed a wild space in our front garden and created a beautiful Mosaic for it. Jan/Feb 2012: Lena from Germany - did a great job restoring our summer gardens and created a stunning mirror painting of the tree of life and a Lizard mosaic. Sept/Nov 2012: Sophia and Maline from Sweden created beautiful mosaics for some of our meditation stools that reside in the upper fire pit garden. Oct/Nov 2012: Michelle from Germany, created a seedling nursery for a wildflower project and created a beautiful Sunflower Mosaic. Nov/Dec 2012: Constanze and Theresea from Germany decorated our home and business for Christmas. Constance created a stunning Hobbit House Mosaic while Theresa painted a beautiful lake scene on a mirror. Late Dec 2012: Stephanie from Germany, decorated our little lemon tree meditation area. late Dec 2012 Laura (Belguim) Stephanie (Germany) begun work on a mediation space down in front of our home. Feb 2013: Constanze and Theresa (Germany) returning wwoofers then helped Donna prepare another long planned meditation area under the huge cherry trees up behind the home and built a path for many to enjoy for years to come. May 2013: Alessandro (Italy), Karsten (Germany), Ben (France) and Laurance (Quebec) began to clear and develop another long term vision, a large space up behind the house and created our long dreamed Fire pit space, then Ben, Laurance, and Karsten built a Yoga bricked platform. May/June 2013: Cristine (USA) helped finish the Yoga platform/Fire pit area. 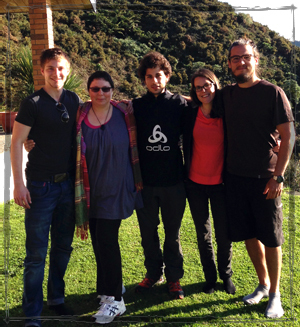 June/Aug 2013: Quentin and Julie (France) helped Christine plant out more trees in the yoga platform area. Quentin and Julie continued to build another quiet seating place near by, created beautiful terraced Vegetable Gardens and strengthened the paths around the area and created 2 beautiful mosaics. Sept2013: Elodie and Antoine (France) completed the new paths/steps from the Terraced Gardens to the new entrance in the fence. They also created a stunning Mosaic Dragon that welcomes and protects the home and Gardens. Antoine was very handy with a hammer and rebuilt our strawberry burrow and redesigned the shelter for it and fixed a few broken things around the home. late Oct/Nov 2013:Thomas from France - repaired the steps leading up to the Terraced Gardens, Cemented the walls of the Terrace Gardens and continued to clear the Gorse beside the Fire Pit area. Nov 2013: Karen and Kristina (Germany) helped out with lots of weeding and created the Life is a Journey Mosaic. Late Nov till Jan 2014: Gaetan (Switzerland), helped to removed Gorse and created a beautiful Everything Flows Mosaic. Dec 2013/Jan 2014: Dennis (Germany). Dennis was our Chef Extraodinaire! Made significant contributions to our Wwoofing Cookbook. Attacked the Gorse by Clearing up a huge area just below the Meditation Platforms and created a wonderful Sunflower Mosaic. Jan 2014: Nathalie (Belgium), Helped keep the Dragon running while I went away. Was wonderful with our Animals and so helpful and friendly. Feb 2014:Tim and Freya (Germany), Did a fantastic job with Quentin and Julie (France, returned before going home to France) to take care of our home, animals and did a fantastic job of clearing dead gorse to make room for further development on our upper hill. They made an incredible dedication Video to Asleeping Dragon! March 2014: Karmen (Slovenia) - Learnt to sharpen our tools with an angle grinder, learnt to clean old concrete off old bricks and laying a path by the compost, she finished off a wonderful mosaic that was started by another wwoofer that left early. March 2014: Lilly (Germany) helped build a Pellet Compost with Terry (Ireland) and helped in the kitchen. She created a wonderful Elephant Mosaic. March 2014: Terry (Ireland) helped build the Pellet compost. April/May 2014: Rob (UK) - Our wandering Mistral! Rob provided us with many wonderful hours of live music while we prepped the meal in the evenings. He left a wonderful musical piece as part of his living legacy here. April-June 2014: Siv and Ingeborg/Ivy (Norway) - Gave the Gorse all they had and some, brilliant in and around the house and were instigators of the Morning Meet ups that we now have on wwoofing days. Siv created a beautiful Yddraisl (Norse Tree of Life) while Ivy also began our League of Nations Flags by making the Norwegian Flag as part of our National Norway Celebration day! May-Aug. 2014: Misao (Japan) So very helpful, willing to learn and created the most amazing meals! Whiz at the Rainbow looming and so gentle with all our animals. Created a beautiful Hydrangea Mosaic and contributed many yummy recipes to our Wwoofing Cook Book! June-July 2014: Diana (Germany) With a go get them attitude, Diana put her all into anything she did here which was a lot! Gorse and weeding were done with great gutso, very helpful around the home and created the Awesome Questions to start folk talking booklet! June-July 2014: Bastien (France) brilliant at also helping out with the weeding/gorse and around the home and created a NZ Falcon Mosaic. July-Aug 2014: Nina (Germany) brilliant at baking and helping out. She created the Gecko Mosaic and also contributed to the Wwoofing Cook Book. July-Aug 2014: Greyson (Hong Kong) spent 6 of his 8 weeks in NZ here and was a blessing on so many levels! worked hard, enjoyed learning to cook from Miaso and was so wonderful with the Dogs. He created the beautiful Fire/Water Yin Yang Mosaic. Aug/Sept 2014: Andrew (USA) Gorse clearing, helping out and another wonderful guitar player. He created the Capt America Mosaic Shield. Sept 2014: Panu (Thailand) tried to learn English and helped as best as he could, he created the beautiful Tai Motif Mosaic. Oct 2014: Astrid (France) wonderful help in the kitchen and with the weeding and Gorse. Astrid loved to draw and left a beautiful picture re-created from a Mural in Paris. Oct 2014: Julia (Germany) Friendly, funny and hardworking, Julia and Astrid became friends and both worked really hard. Julia loved to bake, got into the gorse and added many yummy recipes to the Wwoofers Cookbook! Oct 2014: Janet (Singapore), did allot of wonderful cleaning inside and shared alot about her culture in Singapore. Nov 2014: Johannes - John (Germany) Was very eager to get things done. Helped with some coding of this site and helped Julia choose some trees to add to our edible forest - Plum, Black Current and Red Currents. Brilliant at weeding, gorse plucking and clearing paths. John was also really helpful with meal preps in the evening. Nov 2014:Claire (USA) - Brilliant help in the kitchen and amazing with a paint brush - Her living legacy is the amazing Dragons Eye Painting. Late Nov Early Dec 2014: Steve (Australia) - Awesome help in the kitchen, Cut up lots of felled Gorse into usable lengths and created our first ever and epic Grose Fence! Dec 2014: Willaim (Germany) Gabriel (France) and Laurren (Canada) - helped clear some gorse, weeding and around our home. Jan 2015: Marvin - Germany Epic Window Washer, with Ben (Switzerland) cleaned Grout off the old Concrete bricks from the old house then built our awesome potato/Kumera garden with them. Brilliant sculpturer he created a Mountain and a Snake as part of his living legacy. Always helpful, full of fun and laughter and great discussions. Jan 2015: Ben - Switzerland. Worked with Marvin clearing grout off the old Concrete bricks and building the potato/kumera patch. He then completed the rest of the epic Gorse Hobbit fence around it. Ben also introduced me to Wire Tree making. He created one as his living legacy and I'm hooked! Feb 2015: Sarah (USA) Wonderful Sarah so much fun! Sarah got to do so many firsts here and was very helpful and willing to help in anything. Working with John (Germany) she helped clear Gorse roots for the path they were building. She created the beautiful dreamcatcher in the Pohutukawa Room as part of her living legacy. March 2015: Jess (Canada) - Bright and bubbly, Jess was very helpful, lots of laughter and is gentle and patient, getting to have many firsts here as well. A beautiful lotus Mosaic Pot holder for our kitchen is her living legacy to our home. May 2015: Quentin (New Caledonia) - Never wwoofed before Quentin was eager to learn, and willing to do his best. He worked with another wwoofer Edan to restore the path down to the gulley and make it a little more safer. Removing and cutting Gorse and helping out with the evening meals. May 2015: Edan - (USA) While Edan was only a short stay he helped Quentin re-establish the path to the gulley and also helped cut down and remove Gorse. May/June 2015: In Hey (South Korea) - In Hey was a breath of fresh air! Though she didn't speak much English we did have some wonderful conversations and we learnt alot about South Korea. She was brilliant help in the Kitchen, sharing wonderful Korean dishes with us, Hardworking, honest and very helpful in the garden weeding and very gentle and caring with our Furry Family :) We missed her wonderful presence when she left. end of June to early August 2015: Christina and Patrick (Germany) - Christina and Patrick were our wonderful Home caretakers during July while Donna was away. They were very hardworking, helpful and looked after our home so well. The Furry Family were so well taken care of. They completed mosaicing the old Farm Gate that Justine had started and it was wonderful to share some time with them before they were once again off on their travels. We felt deeply blessed by them indeed! So do you feel inspired by what you have read and want to join our list of gratitude? If so, what will you bring to share with us and leave here as your living legacy? Laurence (Quebec) and Ben (France). Our deepest Gratitude and respect goes to all the wwoofers that are named here and not named here, for the gifts you have brought to our home, to our lives and to our being. You each have brought your being, your presence and have left a blessing in our lives. May you continue to be blessed in all you do and continue to touch, change and evolve our world into a better place of being.	.
Find out what Wwoofing is and what projects Wwoofers have done here. Your Curiosity got the better of you?